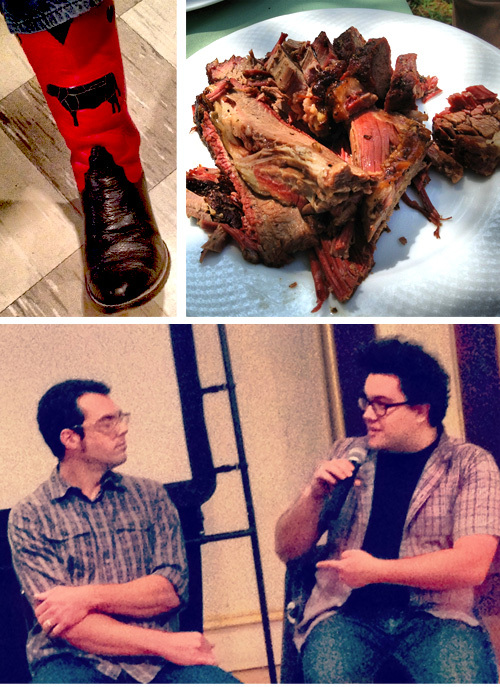 Custom meat diagram boots sported by Daniel Vaughn, Texas Monthly barbecue critic and author of Prophets of Smoked Meat. Contraband brisket from Snow’s; a gift from Daniel Delaney. Aaron Franklin and Daniel Delaney talk about the new business of barbecue. In early April I traveled with my bestie Elizabeth Karmel to Austin for the Our Barbecue, Ourselves Foodways Texas Symposium. 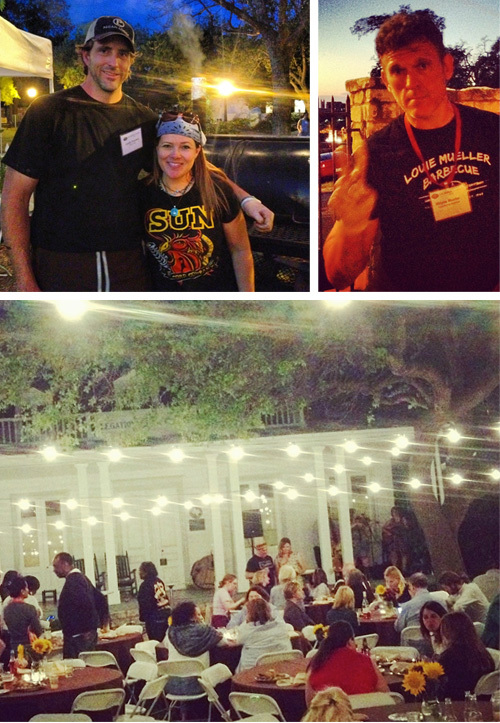 The outstanding programming featured intelligent discussion on various nuances of Texas barbecue. This highly detailed recap captures the details perfectly. 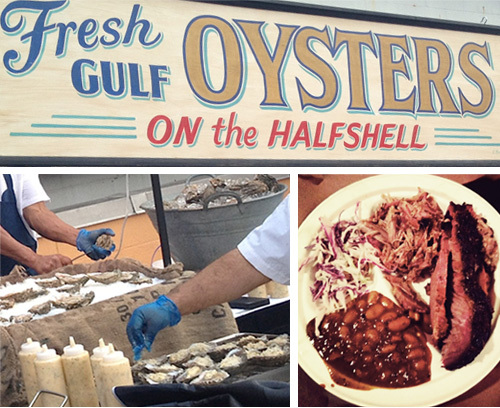 From a rooftop oyster/crab roast and a two meat plate of Franklin Barbecue to a fresh, inventive lunch by uber-talented Top Chef alum Tiffany Derry, the meals were tops. Wayne Mueller freelancing on the Southside Market mobile pit. Gaeton and Pat smokin’ it up. I’m always encouraging my barbecue people to make friends with one another. Here’s a success story from the weekend: Bryan Bracewell was kind enough to pull a pit to Austin for Wayne Mueller to use while cooking the final feast. They met for the first time. Pat Martin was there, too, cooking delicious chicken dipped in his tangy take on Alabama white sauce. New friends Diane and Justin Fourton from Pecan Lodge in Dallas. Peace out, Wayne! Twinkling lights, delicious food, hearty libations – the French Legation provided a magical setting for the final meal. • Who knew onions could be so interesting? Common onions take a very long time to digest and give many people a sour stomach. Reach instead for a Vidalia or, if you’re fortunate enough to be in Texas, go for the Texas 1015, developed at Texas A&M. • Time spent with Keith Schmidt, Bryan Bracewell, and Wayne Mueller is always a bonus. They are smart, kind, and navigating that third-generation barbecue/child of a legend path just like I am. Very blessed to have them in my inner circle. • An opportunity to slow down, meet new food/barbecue people, and listen to new ideas and new perspectives is a gift. Must remember to make time for those events. Check back for more of my adventures in Austin! ← We're getting the band back together. I learned so much during my times in Austin. I was there once a month for two years. Lots of nights exploring and meeting great peple. When I think about sitting on a stool talking about Brisket with Vencil at the Taylor Cafe or shooting the BBQ breeze with Todd at Opies in Spicewood I can’t help but smile. Throw tacos in from Torchys or a cold beer listening to some blues at Antones and I’m wanting to book a flight. It really is my favorite city in America for so many reasons, thank you for making me flashback Amy! Agreed! I’m already planning my next visit. Impossible to do it justice in one short trip!